Day 21 of the 30 paintings in 30 days found me painting things that begin with the letter "O". I started with origami pieces and ended up adding the October calendar and an orange. I also thought the scene would look good with bright colors to go with the orange and oragami papers. When setting up this scene, I kept trying many layouts and wasn't satisfied, they felt too static or boring. Then today I tried again and knew I had the setup I wanted when I saw the accidental creation of a flower in the scene. Can you see the flower? Check below for the answer if you can't. 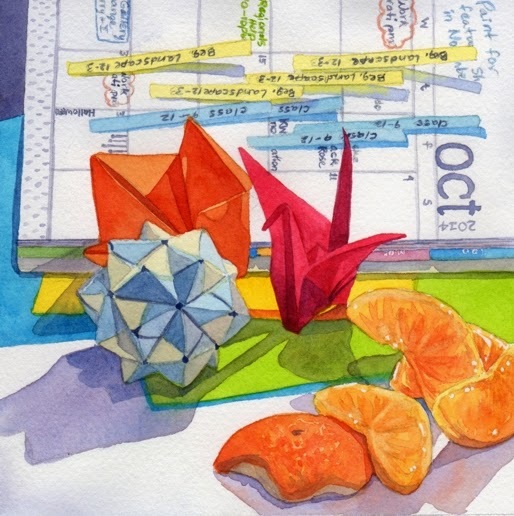 This painting, "Origami, Orange, and October" is a 6"x6" watercolor and it is available on Daily Paintworks for $150 (framed). Click here to purchase. Flower Answer: Look closely at the shadow under the origami pieces. Under the origami crane are the leaves and the stem points toward the left corner where the bloom is. The shadow is exactly as it appeared in the scene when I took the photo!